I love a good thriller. Something that makes my skin crawl, my thoughts get muddled, and the hairs on the back of my neck stand up. I love it when a book leaves me confused and worried and tense. The One I Left Behind is one of those books. Reggie was only 13 when Neptune, the serial killer haunting her town, took her mother. He removes the right hand of his victims on day one, and leaves their bodies on day five. But when Reggie’s mother is taken, her hand is found, but her body never surfaces. Just as this happens, Reggie’s friendships are being put to the test, and she needs someone to be there to help her through it all. 25 years later, Reggie has found a way to live beyond her past, becoming a renowned architect. The past still plagues her though. She doesn’t trust people enough to form solid relationships; she keeps people at a distance. When her mother is brought to a hospital, diagnosed with cancer, Reggie must head home to face the past she wishes would just stay away. The story is told in the present and 25 years ago, through the eyes of 13-year-old Reggie. As an adult, she is starting to see that everything she thought her childhood was maybe wasn’t exactly as she remembered it. She’s having to face things she never thought would come up again and she learns truths she had never questioned as a child. Her mother is dying and still faces the demons of her past, now a shadow of the woman she used to be. As a 13 year old, Reggie didn’t see the truth of her mother; she saw what her mother told her. Her aunt was trying to protect her, but all Reggie saw was an aunt who despised her mother. Reggie knew her mother was flighty, but she didn’t see the seedier side of her life. When the murders begin, she isn’t prepared for the toll they will take on her relationships, both with her family and friends. She’s trying to grow up, confused as to how to do so, and no one is there to help her. In the present, all those old insecurities and problems arise once her mother is brought home. She must face the past and confront it head on in order to find a way to move forward with her life. I must say, this book had me guessing the entire way through. I had a hunch, and while my hunch was correct, I was wholly unprepared for the reveal. I tried to figure everything out, look at all the little clues, but I didn’t see how they fit together until the very end. I was wrapped up in the mystery, trying to figure out Neptune’s reasons for what he did, wondering if understanding his head would help me see who he was. I felt a little like a detective as I read and I really appreciate a book that can make me feel that. 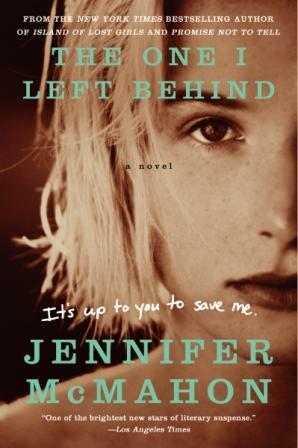 The One I Left Behind is about more than a serial killer. It’s about growing up, confronting the past, and learning that what you see isn’t always the truth. It gave me shivers and had me guessing on the identity of Neptune until the very end. If you’re looking for a good thriller, this is your book. This entry was posted in Contemporary, Mystery, Thriller, and Suspence and tagged Contemporary, Jennifer McMahon, Mystery/Thriller, Suspense.